ST. PAUL, Minn. (5/21/2018)--Heavy spring rains resulting in flooded fields have delayed planting for many farmers in southern Minnesota. The USDA’s Federal Crop Insurance Corp.’s policies have prevented planting provisions for payment if planting cannot occur before the final planting date. There are also options to plant after the final planting date, but with reduced insurance coverage. 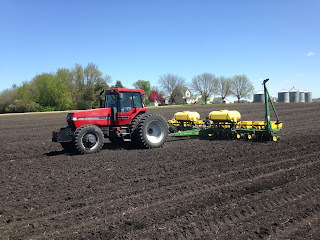 For most of Minnesota, the final planting date for corn is May 31. It is May 25 for northern counties. The final planting date for soybeans in Minnesota is June 10. The late planting period extends for 25 days after the crop's final planting date. Media Contacts: Allison Sandve, Extension news media manager, ajsandve@umn.edu, 612-626-4077 (office) or 651-492-0811 (mobile); David Bau, Extension educator, bauxx003@umn.edu, 507-372-3900, ext. 3906 (office) or 507-360-0664 (mobile). For more news from U of M Extension, visit www.extension.umn.edu/news or contact Extension Communications at extnews@umn.edu. University of Minnesota Extension is an equal opportunity educator and employer. In The News is a weekly sampling of recent Extension news clips from local, regional, statewide and national sources.